When you speak to Swapnil Ajgaonkar, he comes across as someone who is wiser than his years. Perhaps, that is the reason the makers of his latest film 'The Reunions' decided to cast him in a role of a man who is mature and has a lovable personality. In this interview, the actor talks about his beginnings as an actor, his new film, working across different languages and future projects. You are a Maharashtrian and you have acted in a Gujarati film. So, language has never been a barrier for you? No, language has never been a barrier. I have doing plays since 2003. My journey in theatre by doing backstage work. I grew up in Goa where you come across people from different ethnicities and culture. There was an interest to learn different kind of languages. I studied in Mithibai College in Mumbai where my friends' circle consisted of Gujaratis. I started doing Gujarati plays. I have always found Gujarati to be a sweet language. Regional cinema is growing at a rapid pace. What do you think about the growth in Marathi and Gujarati cinema? I am really happy with the growth in both the industries. A decade back, most of the film being made in Gujarat or Maharashtra were very similar and did not offer much novelty. Now, there are so many filmmakers in both the industries who are constantly trying to push the envelope and creating better and fresh content. One of the major reasons behind this is the emergence of some really good writers. You are getting to see a new kind of cinema. Young actors are more interested in getting into films rather than theatre or serials. Regional films are also doing very well outside the states they are made in. They are in a very good space right now. If the acceptance goes on increasing, filmmakers will feel more empowered to make good content. 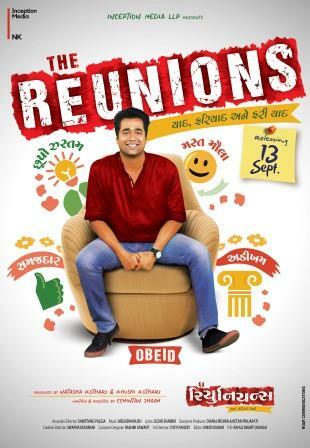 'The Reunions', your new film, has a very urban and fresh look to it. Looking at the posters, one would think that it is a Hindi film. Do you think that the film is in a new space as far as regional cinema is concerned? Absolutely, there is a lot of romance and humour in the film. The main idea is to entertain people. We deliberately wanted the film to have a very urban look. We wanted Gujarati cinema audience to witness something which they have not before. A lot of youngsters do not prefer watching regional films but we want them to come to the theatres for our film and rejuvenate their interest in regional cinema. There are very less scripts which have been written with proper punctuations. When I read the script, I was very happy to see that every sentence had a full stop. There were commas and other punctuation marks at the right places. It was a very well-written and polished script. I have known Chintan for ten years. We used to write, direct and act in those films ourselves. We were not in touch for some time. Tell us something about your role in the film. As the title suggests, the film revolves around the reunion of these seven friends. They are meeting after ten years. The character that I am playing is very wise and mature. In every group, there is one person who is very stable and wiser than others. My character is that person in this group. He is a very likeable character and I am sure the audience will relate to him. I am doing a play which is called 'The Play That Goes On'. I am currently rehearsing for it.